Ok, I have mixed emotions about this…but it did make me laugh so I thought I would share it with you! The American Kennel Club has posted a new episode to the AKC Meet the Breeds TV YouTube Channel – “Feline Fashion Police”. AKC Meet the Breeds TV host Rebecca is joined by Lennon Gaga, Lady Gaga’s Pomeranian alter ego, to decide which Kitty is best dressed. More Feline Fashion will be on display at the AKC Meet the Breeds® event November 19 and 20, the world’s largest showcase of dogs and cats. 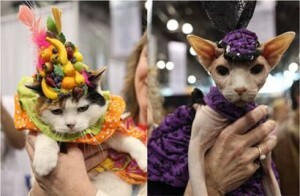 Viewers can vote for Miss Chiquita Banana or Miss Scarlet O’Hairless!